This is me Sarah mum of 3: Shoulder Buddies a new craze? Shoulder Buddies a new craze? 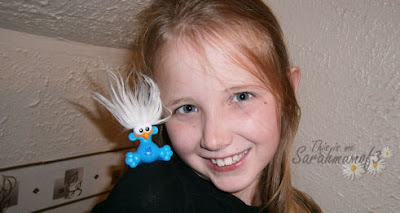 Children love to collect things, and gimmicky collectibles soon become must haves. There is always a new series seemingly popping up, some of the figures and gizmo's that appear as part of a collectible series are just money wasters, children absolutely MUST have them, and pester at every opportunity, only to receive the must have figure and loose it 2 minutes later! Alot of the latest crazes are pocket sized figures which other than looking cute don't have much use, and soon get jumbled into the bottom of the toy box. 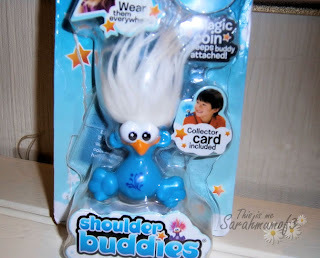 So when we were offered a Shoulder Buddie to review, a cute looking little creature that sit upon your shoulder, envisioned to be the next big thing, already a huge hit in USA I was kean to see if I would be encouraging a collection or steering the children away from them. 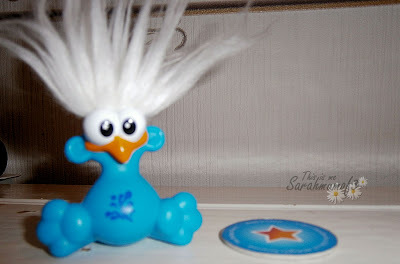 These little figures are cute little bird like creatures with long mad science style hair, there are 8 in the series each having a different symbol on his tummy and a personality to match.This is the first set released in the UK but I imagine that further series will be released so your collections can grow. 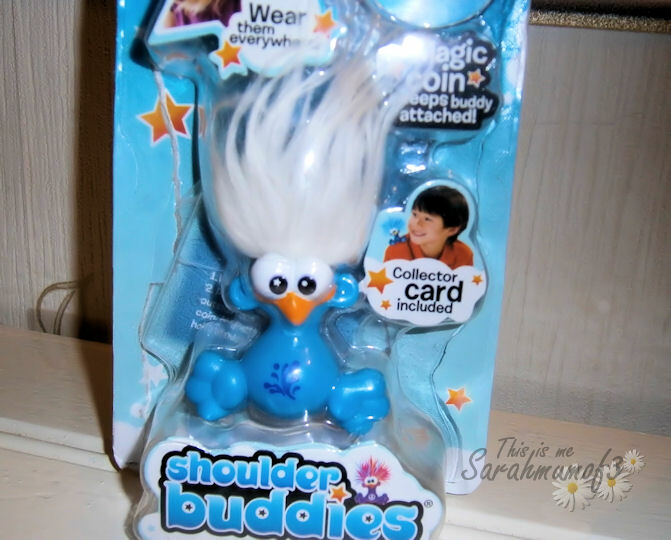 Much like the troll figures I remember collecting as a child, however shoulder buddies are a little bit clever, they come with their own magic star. 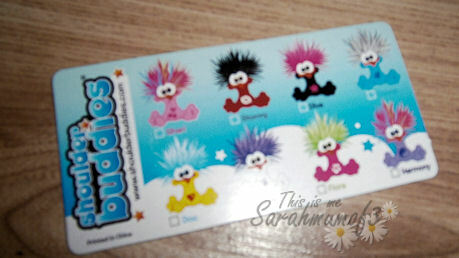 and this enables them to connect to your clothes, hat, backpack pencil case, curtain wherever. The buddies themselves have a magnet in their base and the star spot is a magnet so when you place the spot underneath an item of clothing and sit the buddy on top of the spot with the clothing between the magnets snap together through the clothing and hold the buddy in place. The magnet is strong enough to hold the buddy firm even through denim, and when positioned the shoulder buddy happily sits on your shoulder for as long as you like even when the children are rushing around. The fact they can connect to your clothes, bags, curtains etc gives these little creatures a purpose, they don't get dropped down the side of the sofa or under the bed instantly, They are not too small and fiddly nor are they too big, perfect pocket sized toys. I can really see them being popular with both boys and girls, they are priced around £4.99and you can buy them from shops such as Argos, They would make great birthday presents for school friends, pocket money gifts or well done rewards, and if you have a child who has heard of these little creatures and is pestering you for them, I would say they are one of the nicer must have playground gimmicks. I'm sure its only a matter of time before I see a few of these in out house. We are big lovers of gimmicks here!